I've made curries with veg before and they just tasted boring, no flavour - then after a bit of googling and reading discovered that the trick is to roast the veg first! WOW is all I can say, this curry is fantastic and delicious - my only problem is not eating the yummy roasted veg before it gets in the curry pot! Delicious with freshly steamed rice, this vegetarian meal will make even non-vegetarians super happy! 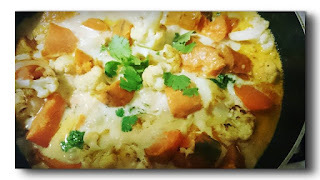 On a big baking tray place the cauliflower and sweet potato pieces. Drizzle with olive oil and sprinkle with sea salt. Pop in a moderate oven for about 40 minutes to bake till the potato is soft. In a big frypan pour a little more olive oil and the butter and gently fry the onion till it is soft and translucent. Add 1 teaspoon of red curry paste (add more later if you like your curry hotty hot) and stir in. Turn the heat down a bit and add the vege stock and then the roasted veg. Add the coconut cream and sprinkle with fresh coriander. That's it!!! Add a bit more curry paste if you like a hotter curry and mix it in. Want your curry more "saucy" - add more veg stock and coconut cream. If you would like to add meat, this is delicious with chicken - simply cut up two chicken fillets into bite sized pieces and dust with flour - gently brown in the pan when you are at the onion stage.